After the (at the time seemingly abhorrent) misadventure with Joe Lynn Turner, Ian Gillan was back in the band, Ritchie Blackmore was unhappy, and the final few months of 1993 saw Deep Purple touring Europe in support of ‘The Battle Rages On’. Plans were made for a live album and two nights (Stuttgart, 16th October, and Birmingham, 9th November) were taped, with the UK gig also being videoed. 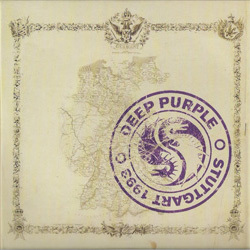 The resulting lacklustre live album ‘Come Hell Or High Water’ has the dubious accolade of being the first contemporary Deep Purple album not to chart since the band became a serious proposition in 1970, and the video of the same name turned out to be a shockingly testament to a band in disarray. The audio tapes of the two gigs were originally released as a box set in 2006 and have seen the light of day separately since then, and they show that if a week is a long time in politics then three weeks is an eternity in a rock ‘n’ roll band. ‘Stuttgart’ – home to a famously partisan crowd back in 1972 – is a joy to listen to. This is the sound of a band on fire, and the CD should find a home in any collection. OK, trying to reclaim the glory days of ‘Child In Time’ was a mistake, and whoever thought playing ‘Anyone’s Daughter’ – a song which should never have been anything other than a B-side in the first place – was a good idea needs a therapist, but the band are tight, exciting and having fun. And what’s more, the four selections from the dreary new album – ‘Talk About Love’, ‘A Twist In The Tale’, the title track and in particular the twelve minutes of ‘Anya’ – sound lithe and fresh amongst the usual suspects of ‘Space Truckin’’, ‘Perfect Strangers’ and ‘Black Night’. In complete contrast, the Birmingham set is the soundtrack of a grown man having a hissy fit. Blackmore didn’t want to be filmed, and took it out of the 9,000 people who paid good money to see a spectacle and instead witnessed a debacle. As the intro to ‘Highway Star’ seemingly stretched on forever Gillan cued the band in and the song was played without the man in black. Blackmore eventually popped out from behind the curtain for his solo – greeted with a roar which should have melted the hardest of hearts – lobbed a beaker of water across the stage at one of the cameras and buggered off back stage once more. After that the cameras were pulled back and, although he did then come on stage, like a naughty child the petulant guitarist did the bare minimum for the rest of the night. If you were there you’d recall how embarrassing the whole evening was. The set on CD is pretty much identical to the Stuttgart show, but there’s no extemporisation, nothing out of the ordinary, and as such the performance is about 20 minutes shorter – although possibly still 100 minutes too long. Roger Glover, Ian Paice and in particular Jon Lord battled bravely on to try and pull a rabbit out of the hat but by the time they did it was as dead as a dodo. If there’s every reason to buy the Stuttgart CD there’s none whatsoever to shell out for the Birmingham show, unless for some masochistic reason you want to sit and endlessly relive one of rock’s most puerile events.